Discussion in 'Java Edition News' started by toropov, Apr 19, 2018. The BlockWars lobby has had it's layout overhauled! We've also revamped the BlockWars pre lobby! The build timer has been tweaked to match a specific mode on BlockWars. The build timer used to be 2 minutes in all gamemodes, even in half blocks when you've placed all your blocks in the first 45 seconds. Now if the game has a specific gamemode, the build timer will change. We've improved some of the previous kits and added into some shiny new ones! The Tank kit has been given a shield and has had it's pickaxe given a sharpness 1 enchantment. The summoner kits Skeleton has been given a bow and the Archer kit will receive an arrow every 20 seconds if their arrow count is below 5. As you know, Trap blocks in a game of BlockWars can be very useful, and now we've made them even more useful. At the start of game players will now receive 2 trap blocks rather than 1. 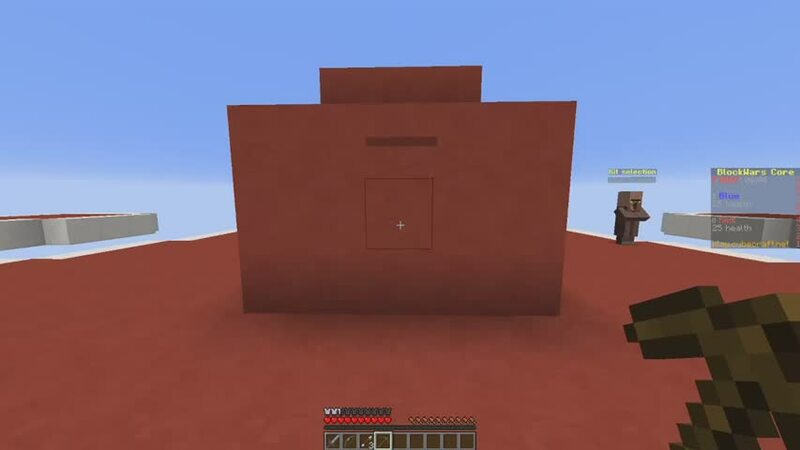 TNT from the Explosion trap blocks is now more powerful and deadly. Monsters released from the Monster Spawner trap block have been increased and they are now smarter. Other than balancing previous trap blocks, we're also added a new one! Setting off a Bamboozler trap block. End of game stats are now in BlockWars! They summarise your stats from a game into a message, showing your kills, deaths and K/D ratio. In Core mode it will show your core damage dealt in percentage and in CTF it will show the amount of flags you captured and attempts to capture. The end of game stats also have a "Top Players" section, this will show you the best players from that game, from both the Red and Blue team. Hovering over the Top Players will show their stats too. End of game stats in Core mode. Potion Party: Have three active potion effects at once. Blockless Wars: Win a game without placing any blocks. Rearranger: Break and place 50 of the enemy team’s blocks in once game. Perfect Match: Win a game of core mode without your core getting damaged. Flag Runner: Capture a flag in under 90 seconds. Core Crasher: Break the enemy’s core in under 45 seconds. Deadeye: Land five successful bow shots in a row. Void Avoider: Win a game without falling in the void. The team balancing system in BlockWars has been changed to act the same like it is in Arcade. If the teams are unbalanced, a message will appear in the chat and everyone within the game will be told to balance themselves out or they will be forced into teams automatically when the timer hits 0. - Replaced the colour wool block from capturing the flag to a colour banner instead. - Made the flag players carry on their head when capturing a flag coloured. - Cactus on the Western map no longer breaks. - The tank kit now has Slowness 2 from 1. - Gave the Archer kit an arrow every 20 seconds if their arrow count is below 5. - The Jumper kit now takes no fall damage. - Changed the icon of the Ninja kit from stained white glass to a nether star. - Increased the amount of trap blocks players gets at the start of the game from 1 to 2. - Increased the TNT blast power of the TNT trap block. _The13thDoctor_, Fantasyz, Yoya and 28 others like this. The BlockWars lobby has been completely overhauled! - The tank kit now has Slowness 3 from 1. Yay! Finally an update, I'm really excited, it's not really that big but still, an update's what block wars needed. The new kits are kinda out of place tbh, and the tank kit is still useless. I hope more people play it now! I'm very excited about this update, especially now that we get two trap blocks. I hope everyone enjoys the update! _The13thDoctor_, Azalea Blödhgarm, Spuuuni and 1 other person like this. From what I can see, it looks really good. I'll be playing later this week! Skyfire_swe, Ruisdier and Tacosbefriends like this. Tank is more than a big punching bag now, hooray!